Let’s face it, the unusually high number of construction projects have made parts of downtown a challenge to navigate and enjoy this summer. For my own sanity I put together a list of projects underway right now in the downtown core (1 square km from Cogswell to the Superstore, waterfront to South Park) with anticipated dates that the sidewalk will be back, with no scaffolding over it. Note – these are approximate! Other projects will start, so this number will go up then. This does not include sidewalk and road paving (done November 2017) or Argyle (September 2017). I may well have forgotten or omitted smaller projects. Please email me so I can update this if so. Also note – sites started since the Construction Mitigation Policy was adopted have temporary sidewalks around them, older ones do not. This refers to when the actual normal sidewalk will be available. I doubt we will have 19 projects underway in the downtown one square kilometer again any time soon. For those that need their data visually – here is a chart of how the construction falls off and sidewalks return. 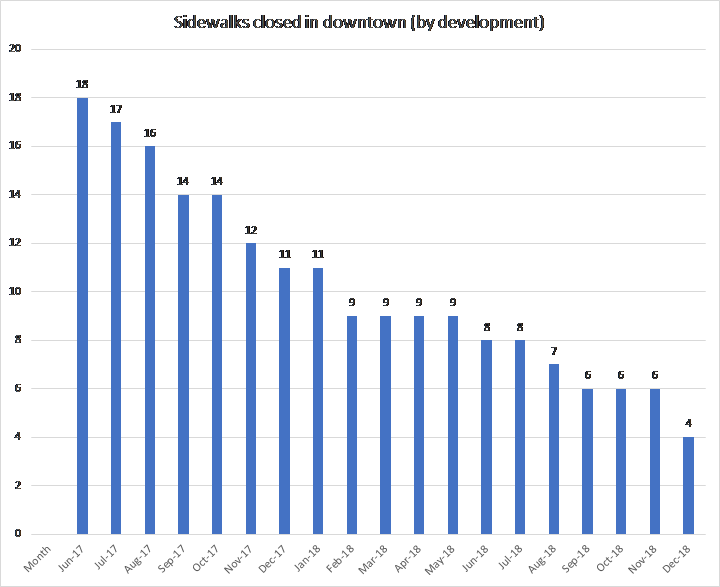 We should have around half as many sidewalks impacted next summer, falling off to 1/4 in the fall of 2018. Again, new projects will start, but I don’t see any really major projects starting in the heart of downtown in 2018. WHEN DO THE SIDEWALKS COME BACK?